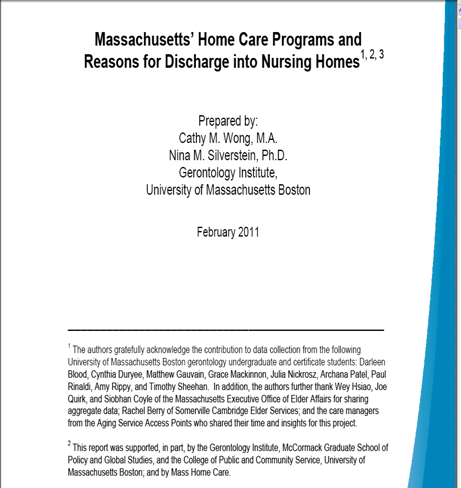 The Gerontology Institute at the University of Massachusetts/Boston this month released a study on Massachusetts’ Home Care Programs and Reasons for Discharge into Nursing Homes. The study, which was partially funded by Mass Home Care, looked at a program snap shot for March 2010, at which time there were 32,417 clients enrolled in the Home Care Basic program, 5,221 clients in Choices, and 4,563 clients in ECOP. The study concluded that 13% of Home Care Basic clients, 17% of Choices clients, and 20.6% of ECOP clients were terminated from the home care programs and placed into a nursing home. Further examination of a subset of clients and interviews with case managers indicated – as home care agencies well know – more and in many cases a more skilled level of community based services is needed to keep clients from nursing homes. Not surprisingly the interviewed care managers call for more 24/7 care options, but the study also calls for more help for patients with medication administration, falls risk assessment and home safety assessment and improved coordination with medical providers, especially in the area of pain management. While there has always been a push in the state home care program against “over-medicalization” of the benefits purchased, it seems clear from this report that there may need to be movement towards supplementing homemaker and home health aide with more professional support for certain clients. ASAP providers: Does your experience match up with this report? Do you have comments that you would like to see reflected in feedback from the Alliance to EOEA? This is a reminder that the Centers for Medicare and Medicaid Services (CMS) will be hosting an “Open Door Forum“on designing a value-based purchasing program for home health agencies. The forum is intended to solicit input from all parties interested in implementing such a program. Value-based purchasing (VBP) is meant to link payment more directly to the quality of care provided and is along the same lines of other payment reform efforts seeking to reward providers for delivering high quality and efficient clinical care. Section 3006 of the Affordable Care Act requires the Secretary of Health and Human Services to develop a plan to implement a value-based purchasing program for payments to home health agencies under the Medicare program. If you wish to participate on Feb 24th, dial 1-800-837-1935 – Conference ID 37941789. More information on this and other CMS Open Door Forums is available here. Masspro completed a series of workshops to discuss the “expedited review process,” used by home health agencies to notify Medicare beneficiaries that their Medicare services are ending. There are two separate forms and slightly different rules depending on Medicare “fee-for-service” (Notice of Medicare provider Non-Coverage) or Medicare Advantage (Notice of Medicare non-Coverage). These forms are to be used when all Medicare services are ending for medical reasons. If care is ending for a technical reason such as homebound, then the beneficiary is given a HHABN. This is a recent clarification from Quest to Masspro our local QIO. Quest is the part of the Quality Net system that QIO’s use to communicate with CMS. QIO’s can ask Quest questions that require clarification by CMS and then publish the answers. Is it appropriate for the HHA to issue a Notice of Medicare Provider Non-Coverage in these types of cases, and for the QIO to review? CMS put out a transmittal a few weeks ago to define several dates that relate to the Face-to-face Requirement. The enforcement date is April 1, 2011. After this date, agencies will not be reimbursed if the F2F documentation is not present in the medical record. The Alliance’s 2011 Home Care Posters are now available for order. Handsome and professionally-printed, they’re perfect for display in councils on aging, senior centers, hospitals, doctors offices, Churches, or anywhere people in need of home care might see them! The posters direct viewers to our website, www.thinkhomecare.org, where they can use our online Find An Agency or our Print Directories to find an agency that suits their needs. Tens of thousands of people in Massachusetts live independently at home with the help of home care. If your family needs help, our online directory can match you with the agency that best suits your need, whether it’s for care 24 hours a day, or just a few hours a week. All packages include four self-adhesive, wall-friendly strips for easy mounting and removal. With the legislature looking hard at cost-saving measures and the Governor’s payment reform bill moving to the legislature for analysis, now is the time to get involved in the Home Care Alliance’s advocacy efforts. This is also why this year’s Home Health Care Advocacy Day is so important. Taking place from 10:00 am to 11:30 am on March 3 in Room 437 of the Massachusetts State House, this event will feature expert speakers touting the value of home care to legislative staff and HCA members who are ALL encouraged to attend. Materials will be available for HCA members who wish to stop by legislative offices and relay what they heard at the briefing after the event concludes. Registration is not required, but please contact the Alliance if you or someone from your agency plans on joining us for this important day so that we know how much materials are needed. Today , Governor Patrick released proposed legislation “Improving the Quality of Health Care and Controlling Costs by Reforming Health Systems and Payments.” The bill calls for “Encouraging the formation of integrated care organizations, commonly referred to as accountable care organizations, comprised of connected or integrated groups of health care providers that achieve improved health outcomes and lower the costs of care. The bill does not explicitly define provides and services that must be encompassed in an ACO instead defining an ACO as “an entity comprised of provider groups which operates as a single integrated organization that accepts at least shared responsibility for the cost and primary responsibility for the quality of care delivered to a specific population of patients cared for by the groups’ clinicians; which operates consistent with principles of a patient centered medical home and satisfies the other requirements of this chapter; which has a formal legal structure to receive and distribute savings; The bill does anticipate that “certain providers that are not primary care providers may be ACO network providers in more than one ACO, as set forth in regulation by the division.” The “division” which has authority to draft authorizing regulations is the Division of Health Care Finance & Policy. The bill calls for greater transparency in payment arrangements and requires that by March 31, 2012, the “Division will “document, categorize and publish all current payment arrangements in the commonwealth between payers and providers.” Medicaid participation in the ACO model is envisioned by 2014. The Alliance will be reviewing this legislation with the Legislative and Policy Committee and the Board of Directors and welcomes member feedback. as to whether home health’s role should be more explicit in this legislation. More than 2,200 2011 Home Health Resource Directories arrived at the Alliance’s office today. We’ll being mailing out copies over the next few weeks. The 2011 edition combines thoroughness with ease-of-use to give you the best guide to home care services in Massachusetts. If you’re a nurse, social worker, GCM, or anyone else who needs to find the best home care agency to fit your patient’s needs, this is the one resource you need. The Resource Directory lists our 189 agencies alphabetically — 15 more than last year — complete with full contact information and a description of the services they offer. It also contains a detailed town-by-town cross reference that lets you find local agencies can provide service to your patient. Sample pages are available here. New to the 2011 Edition, the Resource Directory explicitly lists which agencies are Medicare Certified and which have received the Alliance’s Agency Accreditation. You may order copies on our website or by using the form below, or can download an order form to fax back to our office. You are currently browsing the Think Home Care Blog blog archives for February, 2011.